There are turkey hunters, and there are turkey hunting addicts. My wife Jill Easton and I fall into the latter category. We learned long ago the hunting opportunities provided by a single state just don’t quench the fire. So we travel. Boy, do we travel. In 2016, we hunted turkeys (in this order) in Florida, Mississippi, Oklahoma, Arkansas, Oklahoma again, Missouri, Ohio and Michigan. If you count Oklahoma twice, that’s eight states. This spring it’ll be Mississippi, Oklahoma, Arkansas, Missouri, Kansas, Nebraska, Montana and South Dakota. Again, eight states. Our usual total is nine or 10, but I guess we’re slowing down as geezerhood sets in. If, like us, you need more turkey hunting than your home state offers, follow our lead. Hit the road. We hunt private land some, and every few years we splurge and buy a package hunt with an established outfitter. But because we like to hunt new places and because we’re not particularly wealthy, most of our hunting is on our own hook, on public land. And, in case you’re wondering, this isn't a hardship. Every state but Alaska now offers at least some public turkey hunting. Getting a permit in some places (Nevada or North Dakota, for example) is like winning the lottery, but most states have over-the-counter spring turkey licenses. And there are literally millions of acres of excellent public turkey hunting available, from coast to coast and border to border. If you live in the Lower 48, you’re within a day’s drive of good public hunting in at least four or five states, and probably more. As with anything worth doing, making a successful multiple-state season requires planning – and the more states in the mix, the more careful your planning must be. The first step, obviously, is deciding how many (and which) states you’re going to hunt – decisions obviously limited by the amount of time and money available for the trip. Don’t fall into the common trap of trying to cram too many places into too little time. I’ve been hunting multiple states for about 30 years now, and I still have to resist that tendency. 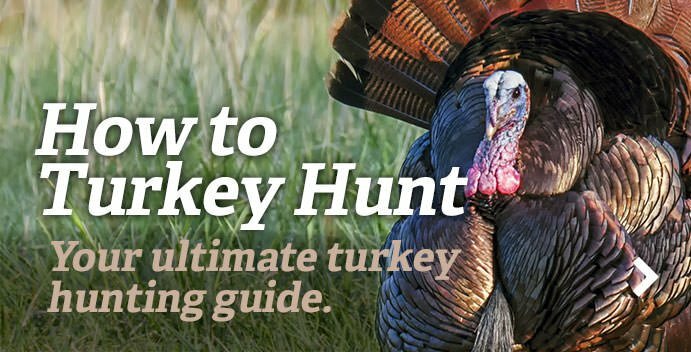 In December it’s easy to plan a three-week, six-state turkey safari, but come April it’s harder to pull it off. Rule of thumb: allow at least five days for each state you plan to hunt. Trust me here, it’s painful to leave a state with unfilled tags, just so you can go to another unfamiliar area and start all over again. If you only have two weeks to devote to a multiple-state trip, limit your plan to three states. Two would probably be better. Remember, you’re going to be hunting unfamiliar territory, and while you sometimes get lucky right out of the chute, it usually takes several days in a new place to get oriented, locate killable turkeys and make things happen. If you tag out quickly in one state, you can use that extra time in the next state on the schedule. Get lucky there as well and you might have time to squeeze in another state, assuming you’ve made a contingency plan to provide for that possibility. Create a schedule that involves minimum travel for maximum advantage. Travel is part of the adventure, sure, but it’s a turkey hunt, not a sight-seeing trip. For example, if you live in Wichita, Kansas, a workable schedule might be to leave home a week before your state season opens on April 12 and hunt western Oklahoma in early April (opening day April 6), followed a week later by Arkansas (which opens April 10), followed by Missouri (which opens April 17), and then back to Kansas to hunt the final week or two of the season, which runs through May 31. A hunter from Nashville, Tennessee, might make a Mississippi, Alabama, Georgia, Tennessee swing, beginning in mid- to late March and ending sometime in April. That would leave time for another trip in late April into May – maybe something such as Kentucky, Ohio, West Virginia and Pennsylvania. See how it works? Minimum travel involved, and maximum hunting opportunity. Once you’ve laid out a rough time framework, it’s time for some research. While the Internet has really helped in this regard over the past 20 years, one-on-one communication is still the best way to find good turkey hunting in unfamiliar territory. It’s easier than you think. Online forums are a good place to start. Many, if not most states, have one or more, and there are several national forums as well. (Gobbler Nation is one example.) Few hunters will draw you a map to their favorite spots, but turkey hunters are generous with general information, and all that’s required is an honest and open inquiry. Opening a forum thread titled, “Need advice on public turkey hunting in …” will generate a lot of information, and may well result in an invitation or two. Don’t overlook the state wildlife agencies, either. Every state has a biologist or two in charge of its turkey program, and while these folks aren’t going to give away their favorite spots, either, part of their job is providing information on turkey hunting in their state. Make phone calls. Send emails. Ask specific questions regarding turkey numbers, recent hatch results, terrain, hunting pressure and the like about WMAs, National Forest lands and other public hunting opportunities. Also, ask these professionals for other knowledgeable references, They are in the loop with the turkey hunting subculture in their respective states, and they can often put you into the loop as well. Once you’ve decided on the areas you want to hunt, get maps. National Forest maps are available at a reasonable cost, and state WMA maps are usually free. Electronic mapping programs such as US Topo Maps and DeLorme are useful, but nothing beats a good paper map for finding your way around on the ground. And unlike your smartphone, a map doesn’t require batteries, and it will still work if you drop it in a creek. Wise hunters use both. Go here for Realtree's Turkey Hunting Nation. Hunting on the road requires more than planning an itinerary. Whether you tent camp, pull a trailer or stay in a series of motels, you’re going to have to take all necessary supplies with you, and that means you must think it through. Unless you have one of those super-organized minds that infuriate the rest of us, it’s advisable to make a list. Hunting equipment (guns, ammo, camo, calls, etc.) is kind of a no-brainer, but things like cooking equipment, adequate non-hunting clothing, paper towels, sunscreen, bug spray, ice chests, assorted plastic zipper bags and scores of other peripheral but essential items might get forgotten unless they’re on the list. As the years pass and you gain more experience as a turkey traveler, your list will become more specific to your needs and therefore more efficient. You’ll learn what items are really important and what can safely be left behind. But you still need a written list, to make sure you don’t forget things. You might have noticed a mention of “ice chests” in that partial list above. Many hunters making their first multiple-state hunting trip give little or no thought to the problem of taking care of their turkey meat while on the road. With a camper, that’s not so difficult; Jill and I have a 5-cubic-foot freezer in our home away from home. But for a tent camper or motel warrior, this is probably not an option. Keeping the meat in a standard ice chest is okay for a while, as long as it’s kept well-iced, but after a week or so that starts getting iffy. Better to have a small portable freezer, 1 or 1 1/2 cubic feet. Models are available that can be used with regular AC current or plugged into an automobile’s charging port, and they’ll hold the breasts and legs of several turkeys. Be sure to keep proper documentation of all harvested turkeys. Getting checked in Missouri after you’ve killed birds in Oklahoma, Kansas and Arkansas is going to be expensive if you don’t have tags, beards, spurs to go with the turkey breasts in the freezer. Our system is to identify each bag of frozen turkey with a marking pen – “Jill #2 Oklahoma, 4/9/16” or “Jim #1 Ohio, 5/11/16,” like that – and put the corresponding beard, spurs and turkey tag in a like-marked bag into the freezer with the edible parts. We’ve been checked several times over the years, and when we lay all the frozen turkeys and the documentation out and match everything up, we’ve never had any problem. In fact, we’ve always been complimented for our system. There’s a lot more to this hunting lifestyle than we’ve had space to cover here, of course. But part of the adventure is figuring out the challenges and developing ways to cope with them, and here’s the deal: If two basically disorganized, haphazard mopes like Jill and I can do it, anybody can. The opportunities are out there. Go find some. Editor's note: This Realtree.com article was first published March 17, 2017.